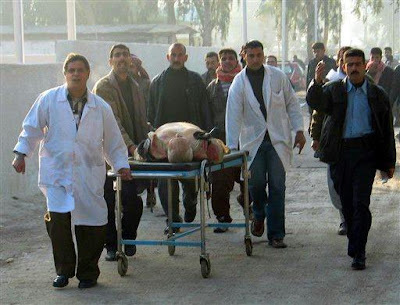 Less is more: The Humble Pig - Our newest terrorist? 'Pandemic' is a word which awakens dark terror in our collective souls. 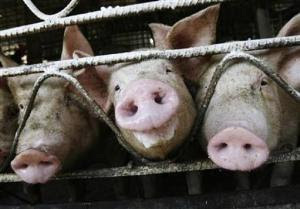 Terror is an emotion that makes people highly maleable to the dictates of survival: first it was Bin Ladan, then Saddam, the Avian flu, Iran, the financial meltdown and now, the humble pig. My approach to dark terror is to find a candle and light it, and start looking around. This blog has been in the simmering pot for quite a few days now. Sometimes a topic just needs more study and this one will need ongoing research. However, I have assembled below some of the more informative lucid articles found during my research which give the A H1N1 swine flu virus, a bit of dimension not found in the scaremongers' main media outlets. These articles raise questions - but do not expect to find answers. Is it coincidental or fortunate that the A H1N1 virus can be treated with Tamiflu, a pharmaceutical stock associated with Donald Rumsfeld? Tamiflu shares are soaring now: fortunes are being made. This has to be taken into the context of other information. So I invite you to take my candle and light your own - perhaps together we can illuminate the darkeness surrounding us; to see if it is indeed as scary as we fear it is. Draw your own conclusions. 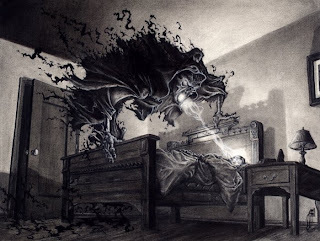 But beware: sometimes there really is a monster under the bed. 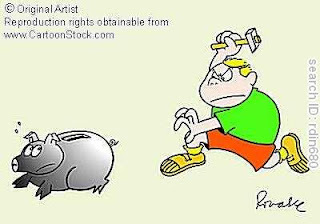 And it might not be the humble pig. H1N1 and its impact on global equity values. Source As the world gears up once again for a flu pandemic that may or may not arrive (it actually seems possible this time), we might want to remember some of the lessons of the last flu scare. One of these is that there are winners as well as losers in every high-profile outbreak of infectious disease. First and foremost among them, of course, is Big Pharma, which can always be counted on to have its hand out wherever human misery presents an opportunity to rake in some cash. In 2005, I reported on the bird flu scare for the Village Voice in a piece called “Capitalizing on the Flu.” We can realistically hope that our current federal government will improve upon the bungled effort made by the Bush Administration to prepare for the onslaught of avian flu—which fortunately didn’t materialize. But certain aspects of the crisis are likely to be repeated, and profiteers will surely waste no time in gathering at the trough. Then, as now, one of the two effective antidotes was a drug called Tamiflu. But this silver bullet came with side effects, as well as a high price tag. As I reported in 2005: With no vaccine in sight, the U.S. government, along with others, is belatedly stocking up on Tamiflu, a drug that supposedly offers some defense against bird flu. But last week Japanese newspapers told how children who were administered Tamiflu went mad and tried to kill themselves by jumping out of windows. In a cautionary statement the FDA noted 12 deaths among children, and said there are reports of psychiatric disturbances, including hallucinations, along with heart and lung disorders. Roche, the manufacturer, is quoted by the BBC as stating that the rate of deaths and psychiatric problems is no higher among those taking its medication than among those with flu. The company is increasing Tamiflu production to 300 million doses a year to meet demand. A report by Citicorp at the time described which pharmaceutical manufacturers and other comapnies stood to make money: Winners could include drug makers such as Gilead Sciences, Roche, GlaxoSmithKline, and Sanofi-Aventis. Other possible winners are hospital chains such as Rhoen Klinikum, cleaning-products makers such as Henkel, Ecolab, and Clorox, as well as home entertainment companies such as Blockbuster and Nintendo…. In order for the pharmaceutical companies to profit from making flu vaccine in the administration’s $7.1 billion pandemic flu plan, Bush now is proposing to ban liability suits against them except in cases of willful misconduct. As for those injured by a flu vaccine, possible lawsuits remain an open question…. With a worldwide market estimated at more than $1 billion, there’s big money in a flu plague. Kimberly-Clark’s Chinese subsidiary is already ramping up manufacture of new lines of medical masks, wipes, and hand-washing liquids, according to Business Week, with consulting firms Kroll and Booz Allen Hamilton selling flu preparedness advice to companies and governments. “Crisis is an opportunity as long as you see it first,” Pitney Bowes’s Christian Crews tells the magazine. Of course, that was then, and this is now. In the coming days we’re bound to discover who’s pulling in the pork this time. But even before the U.S. markets open this morning, early indications aren’t hard to find: “Fears of a potential pandemic are bringing down stock markets around the world today,” public radio’s “Marketplace” reports from London, ”but two big pharmaceutical companies are getting a boost from the news”: Shares in Switzerland’s leading drug maker, Roche, are up nearly 4 percent this morning. The company says it’s scaling up production of Tamiflu. The drug’s been show to be an effective vaccine against the virus. In the U.K., GlaxoSmithKline, which manufacturers its own vaccine against deadly flu viruses, is also gaining in the markets. Glaxo’s drug is called Relenza…. Both drug makers have been approached by the World Health Organization about their readiness to deploy stocks in the case of a pandemic. Roche says it stands ready with 3 million treatments, but warned further production could take up to eight months. The plan outlines how “Canada, Mexico and the United States intend to work together to prepare for and manage avian and pandemic influenza.” featured stories Flu Pandemic Hype: Another Pretext for World Government Ki-moon Ban Ki-moon said the Mexican flu outbreak is the “first test” of the “pandemic preparedness work undertaken by the international community over the past three years.” It was hardly a coincidence that at the same time the U.S. Northern Command, or NORTHCOM, created a webpage dedicated to avian flu and subsequently ran exercises in preparation for the possible use of U.S. military forces in a continental domestic emergency involving avian flu or pandemic influenza. In 2006, NORTHCOM held an international exercise with more than 40 international, federal, and state agencies “designed to provoke discussion and determine what governmental actions, including military support, would be necessary in the event of an influenza pandemic in the United States.” In addition, NORTHCOM participated in a nationwide Joint Chiefs of Staff-directed exercise code-named Exercise Ardent Sentry 06 to rehearse cooperation between Department of Defense and local, state, federal agencies, and the Canadian government. In 2005, then president Bush shifted U.S. policy on avian flu and pandemic influenza and placed the U.S. under international guidelines. In other words, any U.S. response to an avian flu pandemic would be directed under WHO, WTO, U.N. and NAFTA directives. Congress and U.S. agencies would be cut out of the picture. “The U.N.-WHO-WTO-NAFTA plan advanced by SPP features a prominent role for the U.N. system influenza coordinator as a central international director in the case of a North American avian flu or pandemic influenza outbreak,” Corsi adds. Dr. David Nabarro, WHO executive director of sustainable development and health environments, was appointed the first U.N. system influenza coordinator. In 2005, Nabarro said during a press conference that his number one priority was to prepare for the H5N1 virus, known as the avian flu. Nabarro played into the global fear that an epidemic was inevitable. “I’m not, at the moment at liberty to give you a prediction on numbers, but I just want to stress, that, let’s say, the range of deaths could be anything from 5 to 150 million,” said Nabarro. On March 8, 2006, during a U.N. press conference Nabarro predicted an outbreak of the H5N1 virus would “reach the Americas within the next six to 12 months.” On Monday, UN Secretary-General Ban Ki-moon stoked the fear of a global flu pandemic. He said the Mexican flu outbreak is the “first test” of the “pandemic preparedness work undertaken by the international community over the past three years.” Ban Ki-moon said if “we are indeed facing a pandemic, we need to demonstrate global solidarity. In our interconnected world, no nation can deal with threats of such dimension on its own.” For Ki-moon and the global elite, “global solidarity” in “our interconnected world” translates into yet another push for world government. Ki-moon’s dire warning falls on the heels of the G20 summit where plans were announced for implementing the creation of a new global currency to replace the U.S. dollar’s role as the world reserve currency. British Prime Minister Gordon Brown and others repeatedly called for “global governance” and a “New World Order.” The current flu pandemic hype serves as punctuation mark between the G20 held in London and the upcoming one to be held in Italy in June. “The G20 summit has agreed to try to kick start stalled Doha trade liberalization talks at the next G8 meeting,” Reuters reported on April 2. So-called “trade liberalization” is code for the neoliberal plan to “privatize” public and private industries around the world, impose “flexibilization” of labor markets (create massive unemployment), “deregulate” consumer and financial markets, and foster foreign buyouts, layoffs, wage cuts, transient employment, higher prices, and potentially destabilizing capital flows. As noted by the Eagle Forum in October, 2007, the SPP’s North American Plan for Avian and Pandemic Influenza “is not only about combating a flu epidemic but is far-reaching in seeking control over U.S. citizens and public policy during an epidemic.” The Plan would give authority to international bureaucrats “beyond the health sector to include a coordinated approach to critical infrastructure protection,” including “border and transportation issues.” On April 26, Infowars covered the Department of Defense’s “Implementation Plan for Pandemic Influenza” that proposes nothing less than the militarization of health care, military augmentation of civilian law enforcement, and the mass vaccination of the population as directed by the government. Ki-moon, the United Nations, and the globalists, with the participation of the globalist-dominated corporate media and the ruling elite in Mexico, are hyping the flu outbreak as a possible pandemic in order to sell us their scheme for world government. 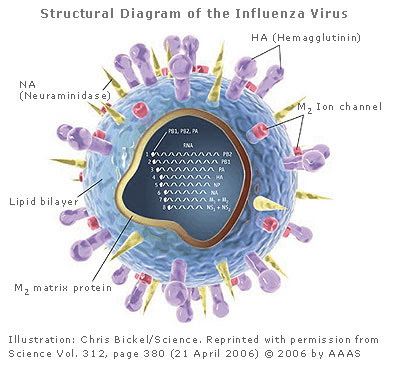 Influenza as a bioweapon does not sound like a particularly grave threat. Annual outbreaks kill many people, particularly the elderly; but a case of the flu is generally percieved as an uncomfortable nuisance rather than a grave threat. But flu viruses can be devastating. 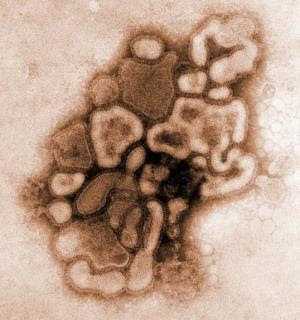 In 1918 and 1919, the so-called "Spanish flu" killed an estimated 20-40 million people worldwide and, since then, the highly changeable flu virus has resurfaced in a variety of particularly virulent forms. Chart of the two mechanisms by which pandemic influenza originates. Attempts to recover the Spanish flu virus date to the 1950s, when scientists unsuccessfully tried to revive the virus from victims buried in the permafrost of Alaska. In the mid 1990s, Dr Jeffrey Taubenberger from the US Armed Forces Institute of Pathology started to screen preserved tissue samples from 1918 influenza victims. It appears that this work was not triggered by a search for flu treatments, or the search for a new biowarfare agent, but by a rather simple motivation: Taubenberger and his team were just able to do it. In previous experiments they had developed a new technique to analyse DNA in old, preserved tissues and for now looking for new applications: "The 1918 flu was by far and away the most interesting thing we could think of" explained Taubenberger the reason why he started to unravel the secrets of one of most deadliest viruses known to humankind. The scientists were aware of the dangers of their creation. The experiments were conducted under high biosafety conditions at a laboratory of the US Department of Agriculture in Athens, Georgia. Possible hostile use of their work was an issue considered by the scientists:"the available molecular techniques could be used for the purpose of bioterrorism" (Tumpey et al. 2002:13849). There is no sound scientific reason to conduct these experiments. The most recent experiments (Tumpey et al. 2002) allegedly seeked to test the efficacy of existing antiviral drugs on the 1918 construct – but there is little need for antiviral drugs against the 1918 strain if the 1918 strain would not have been sequenced and recreated in the first place. It is true that biodefense research – and any kind of civilian medical research – is always a race with its counterpart, the evolution of naturally occuring infectious agents or the development of biowarfare agents. But in this race it should be avoided to create the threats that are allegedly the motivation for the research. A vicious circle is created: "The technologies are in place with reverse genetics to generate any influenza virus we wish ... studies are envisaged using genes of the 1918 Spanish Influenza virus." These arguments were recently brought forward to justify another maximum biosafety laboratory for biological defense work in Texas. Without Taubenberger’s pioneering work, the money for the lab experiments might have been saved and better invested in combatting naturally occuring diseases such as tuberculosis, malaria, or HIV. Other papers argued that the experiments may help to elucidate the mechanisms of influenza evolution and virulence (Taubenberger et al. 1997, Basler et al. 2001), but this argument is also deeply flawed. Since 1918, a many different influenza viruses with different virulence and pathogenicity properties have been isolated and characterised by researchers around the world - a more than abundant source for generations of scientists to study influenza evolution and virulence. A resuscitation of the Spanish flu is neither necessary nor warranted from a public health point of view. There may be many reasons for the individual scientists to work on this project, not least the scientific prestige - the"Spanish flu" subject matter practically guaranteed a series of publications in prestigious journals. From an arms control perspective it appears to be particularly sensitive if a military research institution embarks on a project that aims at constructing more dangerous pathogens - if Jeffery Taubenberger worked in a Chinese, Russian or Iranian laboratory, his work might well be seen as the "smoking gun" of a biowarfare program. In the ultra-secure, ultra-safe West, there is one game we obsessively play, and always get wrong - Risk. We are living longer and healthier lives than any generation of humans ever, but we are obsessed with statistically negligible risks, from paedophiles lurking in bushes to BSE lurking in burgers. Somehow, the real, rumbling risks to our safety - like the destabilisation of the planet's climate - get lost in a shifting parade of bogeymen. When I first began to research bird flu, I thought the real danger was not of a pandemic but a panic-demic. Sir David King, Britain's chief scientist, was struggling to point out that Brits are seven times more likely to win the lottery than to contract the H5N1 variant of avian flu. It's crazy that we are eating less chicken, since avian flu is a respiratory disease and - unless something has gone terribly wrong - your KFC bucket isn't breathing. But the more I discovered from interviewing experts and reading the scientific papers, the more I realised this was one of those rare scares with real evidence behind it. They urged me to look back to the grimy, war-trashed year of 1918 when - in just 24 weeks - a virulent form of influenza ripped around the world and killed between 40 and 100 million people. But I sighed and thought - why worry about it? Humans have no control over viruses. They are natural biological events. I might as well fret about asteroids hitting the earth. Even though scientists warn that we are "overdue" for a similar outbreak, what can we do? But gradually it became clear that this complacency was based on a misunderstanding. Viruses live or die in circumstances controlled by man - and over the past few decades, we have unwittingly transformed the world into a virus-heaven, a place where they can develop, multiply and devour better than ever before. The first virus-friendly change we have made is the incredible interconnectedness of the world. A single doctor on a single day on a single floor of a Hong Kong hotel managed to spread Sars to Singapore, Vietnam, Canada, Ireland and the US without going anywhere, just by coughing and spluttering in the lobby. While the 1918 virus took months to slowly fan across the world - becoming weaker and weaker as it went - today the most virulent strain of a virus will be easyJetted to every continent before we know it exists. The world hasn't just become smaller for e-mail and tourism - it has become smaller for viruses too. The second shift is the sudden concentration of vast numbers of animals and people in extremely close proximity, providing a swollen feeding pool for viruses. Let's look at animals first. Over the past 20 years, the entire world - from Thailand to India - has adopted the model of poultry farming preached by the Arkansas chicken-mongers, Tyson. This crams together unprecedented concentrations of chickens in massive warehouses. The result? Viruses used to be self-limiting - they would pass through a small flock of birds and then die out - but in these conditions, the virus never runs out of hosts. As the virologist Richard Webby says, "We have a bucket of evolution going on." Professor Mike Davis has shown that industrial factory-farming has actually sped up the evolution of the flu virus - and even produced evidence suggesting bird flu was born on Thailand's immense chicken production line. The same thing is happening for people: over a billion humans are now crammed into mega-slums across the world, ensuring no virus is ever left behind. It only takes a few amino acids to mutate in some chicken-factory or distant slum for bird flu to become transmissible human-to-human, 1918-style. Then the lottery odds cited by Sir David King shorten dramatically. Some scientists think this is "inevitable", others "unlikely" - but all agree that even if we dodge a human variant of bird flu this time round, we are facing a 21st century plagued by pandemics because of the new virus-friendly ecology we have created across the world. Yet to my despairing question "what can we do? ", I found there are actually some quite detailed answers. In the long term, it turns out that the morally right things to do are also the best things for human safety. It was always immoral to factory farm chickens in disgusting conditions and to leave a billion people festering in shanty-cities. Now we know it is a matter of national security to end these virus-factories too. Even more importantly, the bird flu crisis should remind us - with a hard slap in the face - that the only means we have to protect ourselves from these new viruses are currently in the hands of private corporations who put their own right to profit above the right of human beings to life. Tamiflu is the only way we have to protect ourselves against a bird flu epidemic. 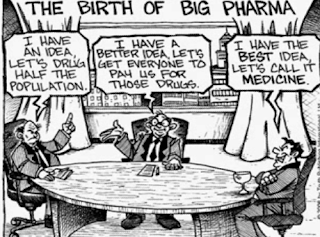 It is an antiviral developed at an American hospital with tax-payers' money, then developed into a pharmaceutical by a small company in California, but it now is controlled by a $20bn-a-year corporation called Roche. They have been insisting on their sole rights to the drug, no matter how urgent other countries' needs. Only after massive pressure did they agree to license a few other companies to use their patent (for a price, of course). Taiwan, in a state of desperation, has begun to manufacture its own generic version - and may face legal action through the World Trade Organisation for the sin of putting its citizens before intellectual property law. Do we want to enter the looming century of viral pandemics with our antivirals - our lifelines - in the bloody hands of drugs corporations who just watched mass death in Africa and prevented anybody from manufacturing life-saving treatments? (Call it Pharmageddon). Isn't now the time to dismantle the WTO system that serves them and build one based on the spirit of Jonas Salk, the man who invented the polio vaccine but refused to patent it, because it would be "like patenting the sun"? Then we could say that - just once - that our endless game of Risk had stumbled on to something that really mattered. The journalists have been told by top officials of the United Nations and the World Health Organization (WHO) about the grave dangers posed by the new and deadly swine flu strain, known as A-H1N1. This flu, never before seen by scientists, has already killed up to 68 people in Mexico and has forced the cancellation of public events, including sports matches and concerts, and the closure of schools, libraries, and museums. Eight cases have been reported in Texas and California. Doctors are examining several students at a Queens high school in New York who displayed symptoms similar to those experienced by swine flu patients in Mexico. Our Mexico City source said a top scientist for the United Nations, who has examined the outbreak of the deadly Ebola virus in Africa, as well as HIV/AIDS victims, concluded that H1N1 possesses certain transmission “vectors” that suggest that the new flu strain has been genetically-manufactured as a military biological warfare weapon. WMR has been informed that the CDC and U.S. Army dug up the body of an Inuit woman who died in 1918 in Brevig Mission, Alaska from an outbreak of Spanish flu. 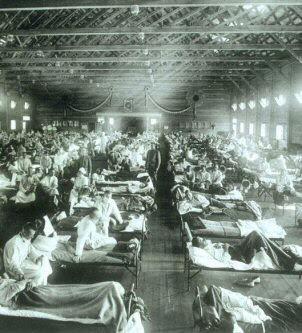 The influenza pandemic that year killed up to 100 million people worldwide in an 18-month period. Brevig Mission saw 72 of its 80 residents die within five days, the worst case recorded anywhere in the world. WMR has been told the genetic material recovered by the U.S. government from the corpse of the Inuit woman provided the basis for the development of the H5N1, or bird (avian), flu strain at the U.S. Army Medical Institute of Infectious Diseases (USAMRIID) laboratory at Fort Detrick, Maryland, the point of origin for the Ames strain of anthrax used in the 2001 bio-war attacks against the U.S. Congress and the media. The fear in Asia is that if the A-H1N1 pandemic spreads to the United States, travel to and from the country will be all but shut down. The following are the symptoms associated with A-H1N1: · cough · fever · sore throat · shortness of breath · muscle and joint pain The drugs Tamiflu and Relenza are seen as the most effective against A-H1N1. [Al-Manar.com.lb is not responsible for the content of this article or for any external internet sites. The views expressed are the author’s alone. 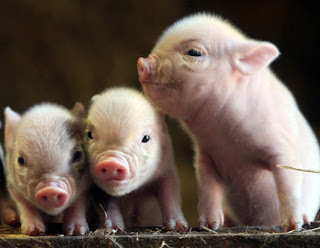 Swine flu panic is spreading in Mexico and soldiers are patrolling the streets after it was confirmed that human to human transmission is occurring and that the virus is a brand new strain which is seemingly affecting young, healthy people the worst. Questions about the source of the outbreak are also being asked after a public health official said that the virus was “cultured in a laboratory”. “This strain of swine influenza that’s been cultured in a laboratoryis something that’s not been seen anywhere actually in the United States and the world, so this is actually a new strain of influenza that’s been identified,” said Dr. John Carlo, Dallas Co. Medical Director. “We have had person-to-person spread with the father and the daughter,” says Wooten, “And also with the two teenagers in Texas, they were in the same school. So that also indicates person-to-person transfer.” “Dr. Wooten says it’s unclear how people were exposed to swine flu. She says none of the patients have had any contact with pigs,” according to the report. Although the situation in the U.S. looks under control, panic is spreading in Mexico, where 800 cases of pneumonia in the capital alone are suspected to be related to the swine flu and the virus has hit young and healthy people, which is very rare with an flu outbreak. Despite the danger of a pandemic, the U.S. border with Mexico remains open. featured stories Medical Director: Swine Flu Was “Cultured In A Laboratory” The WHO insists that the outbreak has “pandemic potential” and has been stockpiling supplies of Tamiflu, known generically as oseltamivir, a pill that can both treat flu and prevent infection, according to officials. As we previously highlighted, those that have a stake in the Tamiflu vaccine include top globalists and BIlderberg members like George Shultz, Lodewijk J.R. de Vink and former Secretary of Defense Donald Rumsfeld. Indeed, Rumsfeld himself played a key role in hyping an outbreak of swine flu back in the 1976 when he urged the entire country to get vaccinated. Many batches of the vaccine were contaminated, resulting in hundreds of sick people and 52 fatalities. The fact that the properties of the strain are completely new, that the virus is spreading from people to people, and that the young and healthy are being hit worst, has disturbing parallels to the deadly 1918 pandemic that killed millions. It is unclear as to why, if the virus is a brand new strain, that public health officials are so confident programs of mass vaccination, which are already being prepared, would necessarily be effective. It certainly wouldn’t be the first time that deadly flu viruses have been concocted in labs and then dispatched with the intention of creating a pandemic. When the story first broke last month, Czech newspapers questioned if the shocking discovery of vaccines contaminated with the deadly avian flu virus which were distributed to 18 countries by the American company Baxter were part of a conspiracy to provoke a pandemic. Since the probability of mixing a live virus biological weapon with vaccine material by accident is virtually impossible, this leaves no other explanation than that the contamination was a deliberate attempt to weaponize the H5N1 virus to its most potent extreme and distribute it via conventional flu vaccines to the population who would then infect others to a devastating degree as the disease went airborne. However, this is not the first time that vaccine companies have been caught distributing vaccines contaminated with deadly viruses. In 2006 it was revealed that Bayer Corporation had discovered that their injection drug, which was used by hemophiliacs, was contaminated with the HIV virus. Internal documents prove that after they positively knew that the drug was contaminated, they took it off the U.S. market only to dump it on the European, Asian and Latin American markets, knowingly exposing thousands, most of them children, to the live HIV virus. Government officials in France went to prison for allowing the drug to be distributed. The documents show that the FDA colluded with Bayer to cover-up the scandal and allowed the deadly drug to be distributed globally. No Bayer executives ever faced arrest or prosecution in the United States. In the UK, a 2007 outbreak of foot and mouth disease that put Britain on high alert has been originated from a government laboratory which is shared with an American pharmaceutical company, mirroring the deadly outbreak of 2001, which was also deliberately released. As we reported yesterday, last time there was a significant outbreak of a new form of swine flu in the U.S. it originated at the army base at Fort Dix, New Jersey.
" because his research was in studying the component parts of viruses, and "that doesn't really help you make a more dangerous version of the virus." But this statement is not consistent with the facts of Professor Wiley's full range of knowledge. Wiley has, in conjunction with another Harvard Professor, Dr. Jack Strominger, won several academic prizes for their work in immunology, including a Lasker prize. Don Wiley is a Harvard professor, but he is also a researcher at the Howard Hughes Medical Institute, and the National Institute of Health. Tribute to Don Wiley from his colleagues at Harvard. The Howard Hughes Medical Institute is located in Chevy Chase, Maryland, and performs biological research, sometimes jointly funded by the Department of Defense and the NIH. 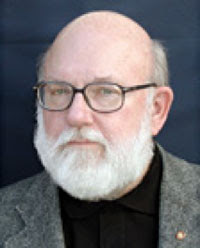 Don Wiley's peers at Harvard include professors such as John Collier performing research on Anthrax. So, contrary to the dismissive tone of the New York Times report, Professor Wiley would be of great value to anyone developing biological weapons. This makes the FBI's obvious disinterest in the case highly questionable, indeed reminiscent of the FBI's obvious disinterest in the numerous witnesses in Oklahoma City who had seen Tim McVeigh in the company of additional perpetrators not to mention the witnesses who had seen additional bombs. Especially in light of the events of 9/11, the vanishing of a scientist with Professor Wiley's expertise in virology and immunology should have been expected to be an issue of critical national importance, yet the official tone of the government was that this is nothing to worry about. Move along citizen, nothing to see. In the context of the Anthrax letters being sent through the mail, any disappearance of any microbiologist under questionable circumstances should have set off alarm bells across the nation. but it didn't. Professor Wiley was assumed to have committed suicide, end of story. The professor's colleagues expressed doubts about the official "suicide" explanation for his disappearance. Then, more biologists started to die under suspicious circumstances. The Very Mysterious Deaths of Five Microbiologists. The body count of infections disease experts continued to climb. Connections to weapons research began to surface. As many as 14 world-class microbiologists died between 9/11/1 and 3/2/2, and on 6/24/2 yet another microbiologist was added to the list. Still the US Government acted as if nothing was amiss, as silent on the question of dead microbiologists as they are on the question of the Israeli spies and their connection to 9-11. In fact, the official silence on the question of how so many top experts in infectious diseases could die in such a short time span is deafening. Now, statistically, it's possible, even likely, that one or two of these microbiologists legitimately were killed in random accidents. But for so many to die in such a short while exceeds all reasonable bounds of statistics. Prudence would demand an investigation, not the "ho hum" attitude of the government which even today continues to issue dire warnings to the general population of how much we are all in danger from "bioterrorism". There is really only one reason to kill off a bunch of scientists. To keep them from doing something they are able to do. What were these scientists able to do? Maybe blow the whistle if an artificially created disease was about to be used in a manner those who created it did not approve of. Regardless of the exact reason, there does seem to be a clear pattern of targeted microbiologists, and paired with it, an obvious government disinterest in the matter. I leave it to you to figure out why. It seems like the most dangerous profession in the world right now is being a microbiologist. Quite a few have turned up dead in last few years from suicides, car accidents, murder, hit and runs, and more at a rate of one or two every few months. Is it all a big coincidence, or something far more sinister? Furthermore, why is the mainstream media ignoring this? Many observers and experts have speculated that certain globalists are getting ready to release a killer plague on the earth. So people that are seen as a threat to that happening (ie. biologists that created the actual plague or are working on vaccines) are being wiped out one by one as a precaution. No matter how you slice it, something strange is definitely going on here. #81: Dr. Mario Alberto Vargas Olvera, age 52. Died: Oct. 6, 2007 as a result of several blunt-force injuries to his head and neck. Ruled as murder. Found in his home. He was a nationally and internationally recognized biologist. #80: Lee Jong-woo, age 61. Died: May 22, 2006 after suffering a blood clot on the brain. Lee was spearheading the organization's fight against global threats from bird flu, AIDS and other infectious diseases. 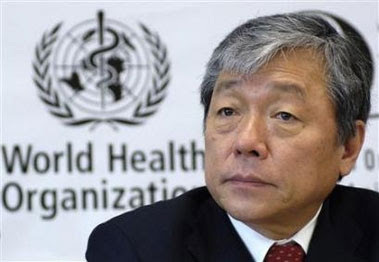 WHO director-general since 2003, Lee was his country's top international official. The affable South Korean, who liked to lighten his press conferences with jokes, was a keen sportsman with no history of ill-health, according to officials. 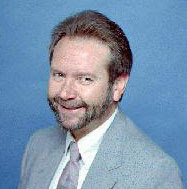 #78: Robert J. Lull, age 66. Died: May 19, 2005 of multiple stab wounds. Despite his missing car and apparent credit card theft, homicide Inspector Holly Pera said investigators aren't convinced that robbery was the sole motive for Lull's killing. She said a robber would typically have taken more valuables from Lull's home than what the killer left with. 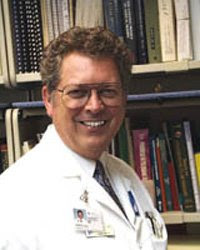 Lull had been chief of nuclear medicine at San Francisco General Hospital since 1990 and served as a radiology professor at UCSF. 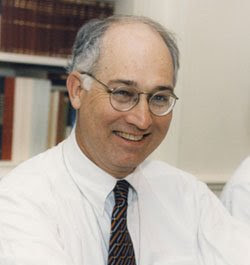 He was past president of the American College of Nuclear Physicians and the San Francisco Medical Society and served as editor of the medical society's journal, San Francisco Medicine, from 1997 to 1999. Lee Lull said her former husband was a proponent of nuclear power and loved to debate his political positions with others. #76: David Banks, age 55. Died: May 8, 2005. Banks, based in North Queensland, died in an airplane crash, along with 14 others. He was known as an Agro Genius inventing the mosquito trap used for cattle. Banks was the principal scientist with quarantine authority, Biosecurity Australia, and heavily involved in protecting Australians from unwanted diseases and pests. Most of Dr Banks' work involved preventing potentially devastating diseases making their way into Australia. He had been through Indonesia looking at the potential for foot and mouth disease to spread through the archipelago and into Australia. Other diseases he had fought to keep out of Australian livestock herds and fruit orchards include classical swine fever, Nipah virus and Japanese encephalitis. 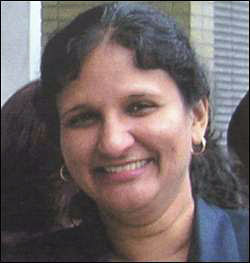 #74: Geetha Angara, age 43. Died: February 8, 2005. 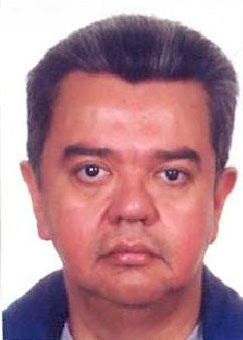 This formerly missing chemist was found in a Totowa, New Jersey water treatment plant's tank. Angara, 43, of Holmdel, was last seen on the night of Feb. 8 doing water quality tests at the Passaic Valley Water Commission plant in Totowa, where she worked for 12 years. Divers found her body in a 35-foot-deep sump opening at the bottom of one of the emptied tanks. Investigators are treating Angara's death as a possible homicide. Angara, a senior chemist with a doctorate from New York University, was married and mother of three. #73: Jeong H. Im, age 72. Died: January 7, 2005. Korean Jeong H. Im, died of multiple stab wounds to the chest before firefighters found in his body in the trunk of a burning car on the third level of the Maryland Avenue Garage. A retired research assistant professor at the University of Missouri - Columbia and primarily a protein chemist, MUPD with the assistance of the Columbia Police Department and Columbia Fire Department are conducting a death investigation of the incident. A "person of interest" described as a male 6'–6'2" wearing some type of mask possible a painters mask or drywall type mask was seen in the area of the Maryland Avenue Garage. Dr. Im was primarily a protein chemist and he was a researcher in the field. #72: Darwin Kenneth Vest, born April 22, 1951, was an internationally renowned entomologist, expert on hobo spiders and other poisonous spiders and snakes. Darwin disappeared in the early morning hours of June 3, 1999 while walking in downtown Idaho Falls, Idaho (USA). The family believes foul play was involved in his disappearance. A celebration of Darwin's life was held in Idaho Falls and Moscow on the one-year anniversary of his disappearance. The services included displays of Darwin's work and thank you letters from school children and teachers. Memories of Darwin were shared by at least a dozen speakers from around the world and concluded with the placing of roses and a memorial wreath in the Snake River. A candlelight vigil was also held that evening on the banks of the Snake River. #67: Matthew Allison, age 32. Died: October 13, 2004. Fatal explosion of a car parked at an Osceola County, Fla., Wal-Mart store. It was no accident, Local 6 News has learned. Found inside a burned car. Witnesses said the man left the store at about 11 p.m. and entered his Ford Taurus car when it exploded. Investigators said they found a Duraflame log and propane canisters on the front passenger's seat. Allison had a college degree in molecular biology and biotechnology. 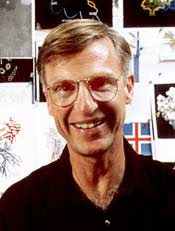 #65: Professor John Clark, Age 52, Died: August 12, 2004. Found hanged in his holiday home. 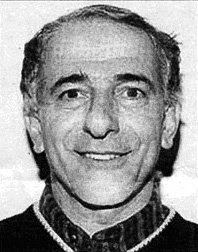 An expert in animal science and biotechnology where he developed techniques for the genetic modification of livestock; this work paved the way for the birth, in 1996, of Dolly the sheep, the first animal to have been cloned from an adult. Head of the science lab which created Dolly the sheep. Prof Clark led the Roslin Institute in Midlothian, one of the world s leading animal biotechnology research centers. He played a crucial role in creating the transgenic sheep that earned the institute worldwide fame. He was put in charge of a project to produce human proteins (which could be used in the treatment of human diseases) in sheep's milk. Clark and his team focused their study on the production of the alpha-I-antitryps in protein, which is used for treatment of cystic fibrosis. Prof Clark also founded three spin-out firms from Roslin - PPL Therapeutics, Rosgen and Roslin BioMed. #58: Dr. Paul Norman, age 52. Died: June 27, 2004. From Salisbury Wiltshire. Killed when the single-engine Cessna 206 he was piloting crashed in Devon. Expert in chemical and biological weapons. He traveled the world lecturing on defending against the scourge of weapons of mass destruction. He was married with a 14-year-old son and a 20-year-old daughter, and was the chief scientist for chemical and biological defense at the Ministry of Defense's laboratory at Porton Down, Wiltshire. The crash site was examined by officials from the Air Accidents Investigation Branch and the wreckage of the aircraft was removed from the site to the AAIB base at Farnborough. #57: Dr. Assefa Tulu, age 45. Died: June 24, 2004. Dr. Tulu joined the health department in 1997 and served for five years as the county's lone epidemiologist. He was charged with trackcing the health of the county, including the spread of diseases, such as syphilis, AIDS and measles. He also designed a system for detecting a bioterrorism attack involving viruses or bacterial agents. Tulu often coordinated efforts to address major health concerns in Dallas County, such as the West Nile virus outbreaks of the past few years, and worked with the media to inform the public. Found face down, dead in his office. The Dallas County Epidemiologist died of a hemorrhagic stroke. #56: Thomas Gold, age 84. Died: June 22, 2004. Austrian born Thomas Gold famous over the years for a variety of bold theories that flout conventional wisdom and reported in his 1998 book, "The Deep Hot Biosphere," the idea challenges the accepted wisdom of how oil and natural gas are formed and, along the way, proposes a new theory of the beginnings of life on Earth and potentially on other planets. Long term battle with heart failure. Gold's theory of the deep hot biosphere holds important ramifications for the possibility of life on other planets, including seemingly inhospitable planets within our own solar system. He was Professor Emeritus of Astronomy at Cornell University and was the founder (and for 20 years director) of Cornell Center for Radiophysics and Space Research. He was also involved in air accident investigations. 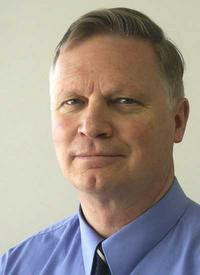 #54: Dr. Eugene Mallove, age 56. Died: May 14, 2004. Autopsy confirmed Mallove died as a result of several blunt-force injuries to his head and neck. Ruled as murder. Found at the end of his driveway. Alt. Energy Expert who was working on viable energy alternative program and announcement. Norwich Free Academy graduate.Beaten to death during an alleged robbery. Mallove was well respected for his knowledge of cold fusion. He had just published an "open letter" outlining the results of and reasons for his last 15 years in the field of "new energy research." Dr. Mallove was convinced it was only a matter of months before the world would actually see a free energy device. #53: William T. McGuire, age 39. Found May 5, 2004, last seen late April 2004. Body found in three suitcases floating in Chesapeake Bay. He was NJ University Professor and Senior programmer analyst and adjunct professor at the New Jersey Institute of Technology in Newark. He emerged as one of the world's leading microbiologists and an expert in developing and overseeing multiple levels of biocontainment facilities. #52: Ilsley Ingram, age 84. Died on April 12, 2004 from unknown causes. Ingram was Director of the Supraregional Haemophilia Reference Centre and the Supraregional Centre for the Diagnosis of Bleeding Disorders at the St. Thomas Hospital in London. Although his age is most likely the reason for his death, why wasn't this confirmed by the family in the news media? #51: Mohammed Munim al-Izmerly, Died: April 2004. This distinguished Iraqi chemistry professor died in American custody from a sudden hit to the back of his head caused by blunt trauma. It was uncertain exactly how he died, but someone had hit him from behind, possibly with a bar or a pistol. His battered corpse turned up at Baghdad's morgue and the cause of death was initially recorded as "brainstem compression". It was discovered that US doctors had made a 20cm incision in his skull. 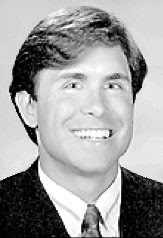 #49: Dr. Michael Patrick Kiley, age 62. Died: January 24, 2004. Died of massive heart attack. Ebola, Mad Cow Expert, top of the line world class. It is interesting to note, he had a good heart, but it "gave out". Dr. Shope and Dr. Kiley were working on the lab upgrade to BSL 4 at the UTMB Galvaston lab for Homeland Security. The lab would have to be secure to house some of the deadliest pathogens of tropical and emerging infectious disease as well as bioweaponized ones. 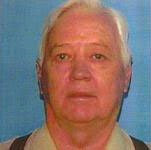 #48: LEAD Technologies Inc. V1.01 Robert Shope, age 74. Died: January 23, 2004. Virus Expert Who Warned of Epidemics, Dies died of lung transplant complications. Later purported to have died of Idiopathic Pulmonary Fibrosis which can be caused by either environmental stimulus or a VIRUS. It would not be hard to administer a drug that would cause Dr. Shope's lung transplant to either be rejected or to cause complications from the transplant. Dr. Shope led the group of scientists who had an 11 MILLION dollar fed grant to ensure the new lab would keep in the nasty bugs. Dr. Shope also met with and worked with Dr. Mike Kiley on the UTMB Galveston lab upgrade to BSL 4. When the upgrade would be complete the lab will host the most hazardous pathogens known to man especially tropical and emerging diseases as well as bioweapons. 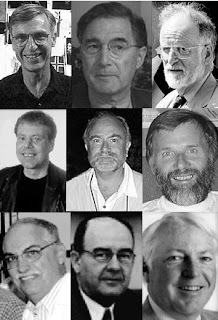 PLEASE NOTE: OUT OF 10 URLS ON DEATHS OF MICROBIOLOGISTS, 8 HAVE BEEN REMOVED FROM THE WEB.